You have been in a relationship with your ideal guy for some time, and he hasn’t popped the question “will you marry me?” So, what next? 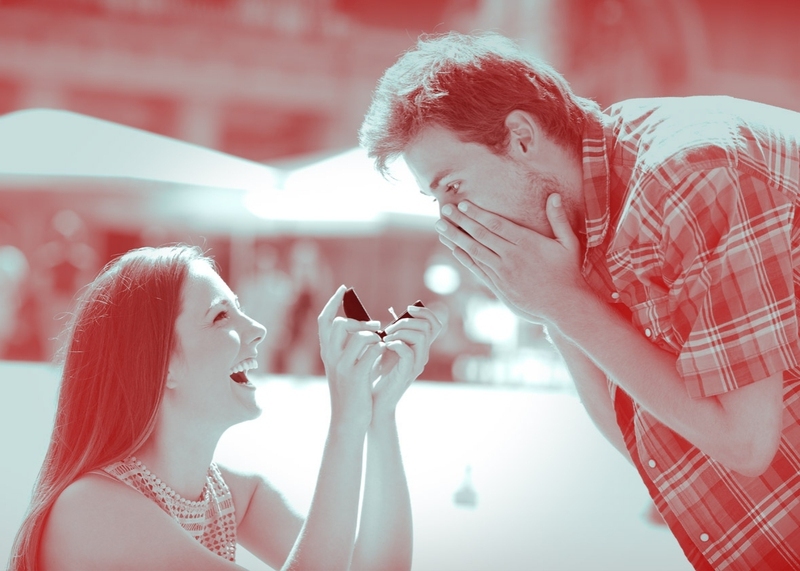 Guys sometimes can find it difficult to express themselves, including proposing to you. In such circumstances, you don't have to go on waiting him to propose. You can do it yourself. When taking this big leap of faith, pick a date that bears special meaning to both of you. It could be the day you met or the anniversary of your first date from which you can recall all the cherished memories of butterflies in the tummy. Or it can be the Valentine’s Day. Just make sure it is a day that will forever remain etched in your memories with beautiful connotations. At best, pick a spot that is sentimental to both of you. Or take him to a place you know he loves. Ideally, it's a beautiful quiet place with no hustles and bustles of human hurry and noise. Avoid busy places like coffee shops, theaters, and malls unless you are sure that he won't mind at all. How to propose to a boy? Compose yourself before popping the big question. Remember that once the words leave your lips, you cannot take them back. So prepare for any eventualities. Open your feelings to him and let him know why you love him and what you love about him. The information may be a little surprising to him, so give him some time to let it sink in and let him know that you will always be there. Gifting your man with a symbolic item/gift is how you win in proposing to him. An engraved ring, bracelet, pocket watch or even a necklace is the way to go when it comes to jewelry for men. Since you know him best, you can pick out what he would love best. Other than that, you can choose to invest your time painstakingly to make him something epic yourself. Make something cool, attractive and elegant that will get him to want to spend the rest of his life with you. Something like a cool leather wallet is a great gift especially if you can get it engraved with some magic words. Of course, no amount of sentiments that ring true can shield you from the possibility of rejection. Rejection is a risk you must consider as you think of how to propose to a boy. But it is a risk worth taking. If he rejects you, be strong and move on. At least you get closure knowing the real state of your relationship rather than being in a boat that you are not sure where it is sailing to. As they say, there are plenty of fish in the sea. By now, you know your guy inside out, his likes and dislikes, his favorite food, movies or music. Focus on his favorite stuff. This move will let him know that you know him well and you care about making him happy. Include elements of his favorite stuff in your proposal plan to make him feel extra special. Cooking your guy his favorite meal will surely get him sentimental and make him fall harder for you. If you are not good in the kitchen or just don't know how to cook, how about you take some culinary classes just for him. He sure will feel special once he sees all the pains and effort that you have taken to get him to say "I do." Another option is to treat him at his favorite restaurant and later on pop the big question when he is satisfied and happy. As they say, the way to a man's heart is through his stomach. Making a video of your moments together with a song that you both love or his favorite love song playing is just perfect. Use beautiful and sentimental words in your video. Also, pay consideration to the length of the video. Don't make it too long or too snappy either. Make sure it takes just the right amount of time that will keep him engaged and still appeal to his emotions. To add more spice, at the end of the video add a "will you marry me?" question to crown it and sum up your life together. This is a fantastic way of how to propose to a boy. Even in the digital age of emails and other instant forms of communication, a love letter is a grand way of conveying your feelings to your Mr. Right. You can put all the words in your head on paper if you can't risk saying them out loud. It will be perfect if your dude is into reading books or poetry. Your dude probably has a hobby that he loves. You can take part in his hobby to get him revved up for the proposal. Maybe he is into basketball, and then how about you challenge him to a match even if you don't have the slightest idea of how to shoot. Just put in some effort and enjoy your time with him. He will also enjoy his time with you. You can also make a bold move and talk to his parents. Let them know clearly how you feel about their son, how much you wish to spend the rest of your life with him, and that you will stand by him and have his best interests at heart. Every parent wishes for their child to settle down with someone who will stand by them through thick and thin. Let them know that you are that person. This audacious move may just earn you a ticket to the wedding train.